1. Administration of a government chiefly through departments which are staffed with non-elected officials: The entrenched bureaucracies in the government have caused many delays in processing important payments to those who are entitled to tax refunds. 2. 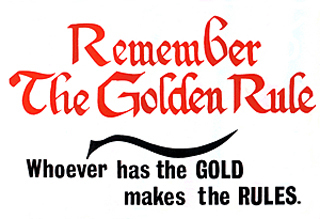 The management or administration which is marked by hierarchical authority among numerous offices and by fixed procedures: Some government offices are accused of being a rigid bureaucracy and thus impeding or slowing down actions because of their overly strict adherence to rules or regulations. To satisfy the government bureaucracy, James and Jane had to fill out several different forms and then they had to wait for some weeks before they obtained the payment that they had coming to them. 3. An administrative system in which the need or inclination to follow rigid or complex procedures interferes with efficient and effective actions: Innovative or new ideas too often get bogged down in red tape in a bureaucracy. Too often bureaucracies insist on going through rigid routines, resulting in delays in making decisions or in carrying out requests. This is also known as "red tape" which comes from the former use of red or pink tape to tie up or to seal official documents for security reasons. 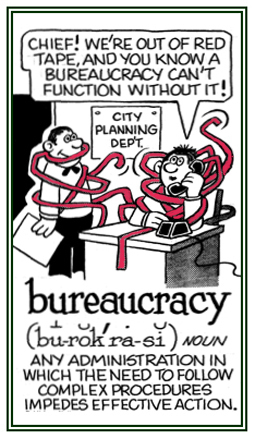 Too often a bureaucracy is where more is said than is actually done. Red tape is what binds bureaucracy together and it represents projects that are often never completed until the weight of the paper work is equal to the weight of all the workers who are involved. Garden City, New York; 1983; page 500. 1. Referring to the actions of governments by a mixture of officials who often collectively hinder the efficiency of results. 2. Rule by “desks” or government officials who "govern the desks". The actual work of government is too unglamorous for the people who govern us to do. Important elected officeholders and high appointed officials create bureaucratic departments to perform the humdrum tasks of national supervision. Government proposes, bureaucracy disposes; and the bureaucracy must dispose of government proposals by dumping them on us. The Atlantic Monthly Press; New York; 1991; page 85. 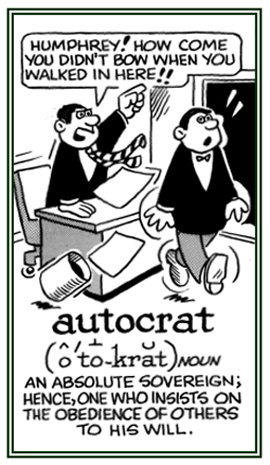 A group of non-elective government officials and an administrative policy-making group.Bureaucratism is the administrative system governing any large institution, whether publicly owned or privately owned. A public administration in many countries are examples of bureaucratisms, but so is the centralized hierarchical structure of a business firm. The United States military establishment, civil service or government workers and officials are other examples of bureaucratisms who are usually hired on the basis of competitive examinations. The shopkeeping interest or class: Capelocracies are businesses which are controlled or governed by shopkeepers. A new government that makes laws, rules, regulations, collects taxes, and prints money: There often are newly organized legislatures or cenocracies which are created by citizens in many countries. 1. A new government for the people. 2. Etymology: from Greek kainos = ceno, "new, recent" + Greek demokratia, "popular government" from demos, "common people". A reference to governments that have officials of different skin colors. 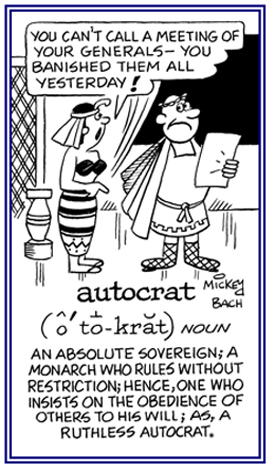 Rule of the wealthy; a plutocracy: A chrysocracy is considered a governing power or ruling of a country by those who have the gold to back up their wealth and strong political influences. Government control, or rule, of the whole world. Showing page 2 out of 9 pages of 129 main-word entries or main-word-entry groups.